By LUDWIG VON KOOPA - The whole series laid out here for your enjoyment. For the past two months, I've been releasing weekly installments of KoopaTV's original drama series, How Team Koopa Escaped Rio. It's so dramatic, so epic, so scrumptiously tantalising, that it gets the italicised treatment. I'm pretty happy with it. So, I want to give the series the treatment it deserves by putting together this article which will function as a Table of Contents for the series. It's done now, so what'll follow should be everything. Read every linked-to article in order to get the full experience. This'll be up as a tab on the site for a while. 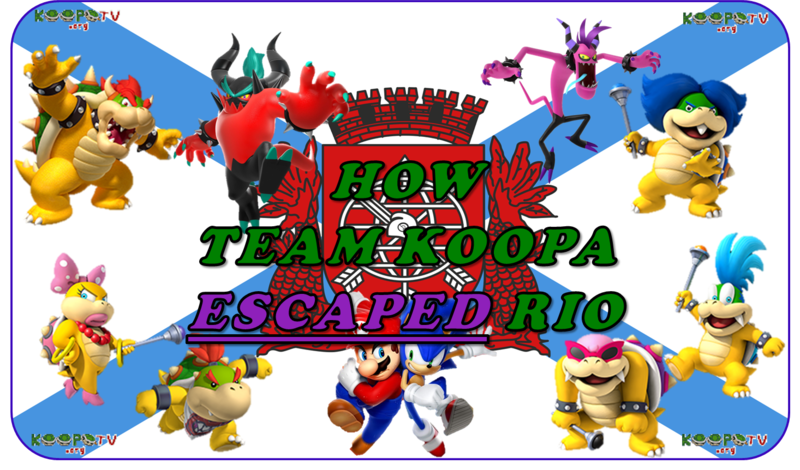 Promotional image for How Team Koopa Escaped Rio, a KoopaTV special series. Just a reminder: The How Team Koopa Escaped Rio series exists in the first place because I felt I needed to let you, the readers/viewers/players of KoopaTV, why we were on hiatus for ten days after April 1st from our normal publishing schedule. It's basically an apology from the KoopaTV staff to you guys for letting you down. And because I feel so bad (and not because of any skill-related issues), I want to take this time to announce that I will not be participating in Team Koopa's training session in Rio this June 23rd, which will be represented by the Nintendo Wii U game Mario & Sonic at the Rio 2016 Olympic Games. That means I will not be, to my knowledge, in that game. The events preceding How Team Koopa Escaped Rio are encapsulated in the Nintendo 3DS game, Mario & Sonic at the Rio 2016 Olympic Games. I definitely am in that game. ...Yes, the names of the games are the same. That wasn't my idea. I'm working out with Team Koopa management (aka King Dad) about whether or not I'll actually be in the Olympics in August of 2016. It's first announced that Koopa Kingdom will have some kind of representation at the Rio 2016 Olympic Games, with KoopaTV staffers Ludwig Von Koopa and Wendy O. Koopa part of that representation. Ludwig is going to be playing table tennis, which he erroneously calls “paddle.” This likely demonstrates that, as of December 2015, Ludwig has no idea what he's doing and has a lot of training to do. Ludwig is also under the impression that he'll be participating in every sport. Ludwig warns that he doesn't know how KoopaTV will run in 2016, and says a hiatus may be possible. Ludwig formally announces which Koopas will be participating as part of Team Koopa: Himself, Wendy, King Bowser Koopa, Bowser Jr., Roy Koopa, Larry Koopa, Dry Bones, and Dry Bowser. Ludwig also outlines which sports each member will be playing, and declares that he will be focusing on table tennis. Team Koopa finally arrives in Rio itself for training, where they encounter the other participating teams. In general, Team Koopa is dominating the training sessions against their Team Mario and Team Sonic counterparts, and Ludwig even won a four-person table tennis training tournament against Luigi, Sonic, and Zazz. Sporting a custom author avatar just for this article, Ludwig describes that the Rio de Janeiro officials are not allowing most of Team Koopa's members (besides Dry Bones and Dry Bowser) to leave the city from Rio de Janeiro International Airport, otherwise known as the Galeão International Airport. This is because of suspicion that Team Koopa's members are infected with the Zika Virus. The author goes over what having Zika Virus means, and guesses how he could've obtained it. Ludwig says he won't be able to update KoopaTV until this mess is over, and leaves the site to KoopaTV staffers Kamek and Vortexica. This begins the series, taking place between Friday, April 1st to Sunday, April 3rd. Ludwig just finished publishing the Team Koopa Contracted ZIKA Virus at Rio?! article (see above) and makes an embarrassingly long journey to meet up with his siblings. Once there, they devise a plot to find and harass Team Mario and Team Sonic. They split up, and encounter the first sign of conflict: Zazz, the Zeti that Ludwig believes gave him the Zika Virus to begin with. Part 2, taking place on Sunday, April 3rd. Ludwig and Bowser Jr. fight Zazz, with some human commotion as well. They then report back to Bowser, in failure, since their purpose of venturing out was to find Team Mario's gym. The third part takes place between Monday, April 4th to Wednesday, April 6th. Because of the Koopalings’ (and Bowser Jr's) failure to accomplish much of anything besides suspicion and surveillance from the humans of Rio de Janeiro during their field trips, they are to stay within the airport with their father. Larry tries to move the plot along, however. The story is now moving to the second half. This part takes place from Wednesday, April 6th, to Thursday, April 7th. Every member of Team Koopa besides Bowser go back to the part of Rio de Janeiro where Ludwig started the story, with two objectives: Investigate Rio de Janeiro's second airport, Santos Dumont Airport, in order to find an alternative way out of Rio; and investigate the Novotel Rio de Janeiro Santos Dumont hotel to try to track down Mario and Sonic. The story is soon coming to an end. This part takes place on Thursday, April 6th. For one reason or another, the children of Team Koopa all fail in their objectives. King Bowser, however, wants the Koopalings and Bowser Jr. to return to Rio de Janeiro International Airport. Apparently, sitting around and doing nothing makes him the successful, productive Koopa. Bowser becomes really mad at Ludwig for some reason. The last part of the story places place on Friday, April 7th. Rio de Janeiro International Airport is under attack by a returning Zazz, and his boss, Zavok! King Bowser Koopa and his children try to fight them off. Not to protect the airport, but for self-preservation. Eventually, Kamek arrives to turn the tides around, and Ludwig goes shopping before returning to Koopa Kingdom, ending the story. Ludwig, Roy, and Dry Bones left Team Koopa, while Bowser, Bowser Jr., Wendy, Larry, and Dry Bowser return to Rio for another training session in June. Bowser and Bowser Jr. choose to try playing every event they can. This is all amidst political turmoil within Brazil. Team Koopa, despite its two sessions of in-Rio practise, have decided to drop out of the Rio 2016 Olympics the night before the August 5th Opening Ceremony amidst problems of Zika, pollution, and terrorism. The entire KoopaTV staff, including Ludwig, Wendy, and Kamek, watch the Rio 2016 Olympics Opening Ceremony. All without being present in Rio. Unfortunately, not having a front-row seat means they have to deal with abusive broadcasters such as NBC. Ludwig, Rawk, and Kamek watch the Rio 2016 Olympics Closing Ceremony and live react to it. It starts off really lame, until the Brazilians hand it off to Tokyo for the Tokyo 2020 Olympics. There, they are stunned as they witness Mario in Rio de Janeiro, on live broadcasting! Even more surprising, is that it appears as if Japan's Prime Minister, Shinzō Abe, is Mario! It can't be true that Mario and Prime Minister Shinzō Abe are the same person, can it? Through an investigation, KoopaTV reveals the demonic truth about Mario's Cap, and Shinzō Abe's involuntary transformation. Mario's Cap has its own identity: Cappy. Cappy is trying to take over everyone it can by capturing them! Ludwig doesn't know if he'll ever write another dramatic series like this again for KoopaTV, but he hopes that the circumstances that created this one are never replicated. Ludwig maintains that the How Team Koopa Escaped Rio series is a true story with no embellishment. Everything in this index from 2016 was collectively awarded Best KoopaTV Article Series of 2016. Mario hopefully is and will stay dis-invited from the next set of Olympic games.